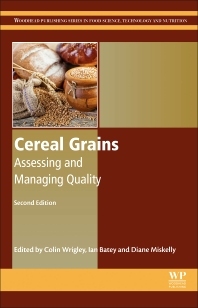 Cereal Grains: Assessing and Managing Quality, Second Edition, provides a timely update to this key reference work. Thoroughly revised from the first edition, this volume examines the latest research and advances in the field. New chapters have been added on alternative grains, including ancient grains and pseudocereals, biosecurity, and industrial processing of grains, amongst others. Quality and food safety are important throughout the value-addition chain, from breeding, production, harvest, storage, transport, processing, and marketing. At all stages, analysis is needed so that quality management can proceed intelligently. These considerations are examined for each of the major cereal species, including wheat (common and durum), rye and triticale, barley and oats, rice, maize (corn), pseudocereal species, sorghum, and the millets. Divided into five sections, the book analyses these for the range of cereal species before a final section summarizes key findings. A Research Fellow at CSIRO Food and Nutritional Sciences, Colin W. Wrigley has received international recognition for his 48 years in cereal chemistry research. His work is described in nearly 600 publications and he was made a member of the Order of Australia in the Queen’s Birthday Honours. Ian Batey has over thirty years of research experience in cereal science. He has published widely and been an Associate Editor of the journal Cereal Chemistry (AACCI) for eighteen years. He is a past recipient of the Founders Award of the Cereal Chemistry Division of the Royal Australian Chemical Institute. Diane (Di) Miskelly has over forty years’ experience in cereal science and technology in public and private sectors. Including consultancies to wheat, milling and food industries, wheat and grains research, Asian product research and development and manufacturing and commercial customer and internal company technical support in raw materials and processing of Asian and Middle eastern end products. She is widely published in cereals and grains in general, with a recent focus on publications in Asian foods. Diane Miskelly, of Westcott Consultants, Australia, has more than forty years’ experience in cereal science and technology in public and private sectors, including consultancies to wheat, milling and food industries, wheat and grains research, and Asian product research and development and manufacturing.